Glamorgan have given a three-year contract extension to off-spinner Andrew Salter, running to the end of the 2019 season. The 22-year-old Salter became a first-team regular in the 2015 season and played 12 County Championship matches, claiming 25 wickets. "I'm really happy, it's been a tough couple of years beforehand learning some big lessons on the way," he said. "But I'm feeling really good and optimistic about this season." Salter had a best haul of three for five in 2015, and scored 411 runs with a top score of 73. He has spent successive UK winters in Australia, first at the Darren Lehmann Academy in Adelaide, before playing club cricket in Sydney. "It's a longer process than I imagined and in some games it felt like it was going really well and others were a hard lesson," he continued. "There have been different chapters (in my career), playing in Australia, the success we had winning four Championship games in a row [in 2015] but the most exciting one is the next one ahead." He was selected ahead of 38-year-old Dean Cosker for most of the 2015 Championship season, but the veteran left-arm spinner was still Glamorgan's most successful bowler in the T20 Blast. 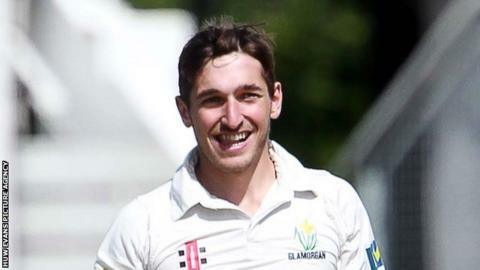 Salter, from Pembrokeshire, is happy to learn from Cosker's former "spin twin" partner Robert Croft, who was appointed as Glamorgan's head coach in February. "It's great having Crofty as head coach because he talks to me about the experiences that he's faced but it is a tough gig at times being an off-spinner when batsmen target you," Salter added. "But that's the art of the game, that's the craftsmanship that I'm trying to learn bit by bit." Can anyone stop Yorkshire this season? Read more on County Championship 2016: Can anyone stop Yorkshire this season?